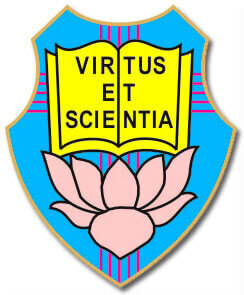 The emblem of Don Bosco School, Park Circus, Kolkata, has a cross, an open book placed on a lotus as symbols and the motto of our school "Virtus Et Scientia" engraved on it. Cross is the symbol of Love, love that gives up everything for the sake of the other till the end. The school functions on Christian Principles based on the life and teachings of Jesus Christ. The Open Book is an invitation to every student to grow in self-knowledge and develop a mind and heart that investigates reality through direct experiences to become a creative seeker of truth. Lotus represents the purity, beauty and wisdom of life a student uphold unaffected by his circumstance. Virtus (virtue) is the moral and ethical quality of a student’s life which enables him to grow into a mature human being. Scientia (knowledge) is the ability to integrate oneself and discover the truth and beauty of life with an enquiring mind. The educative process instills (in the mind of a) student a thirst for this knowledge which leads him to freedom.